Every spring, the Skate Circle returns to Central Park. We skaters do not abandon the park in the winter, though; some years a small group continues skating year round. Still, some New York winters can be extremely harsh, with frigid temperatures and a great deal of snow, so that we must forgo outdoor roller skating for months at a time. By April, however, as the flowering cherry trees begin to blossom, the Central Park Skate Circle starts rolling again. Our area of Central Park has a long tradition of skating. We have found photos of roller skaters and a poster for a Halloween skate party in the park from the 1930’s. There is a famous photo of ice skaters on the rowboat lake from the 1890’s. 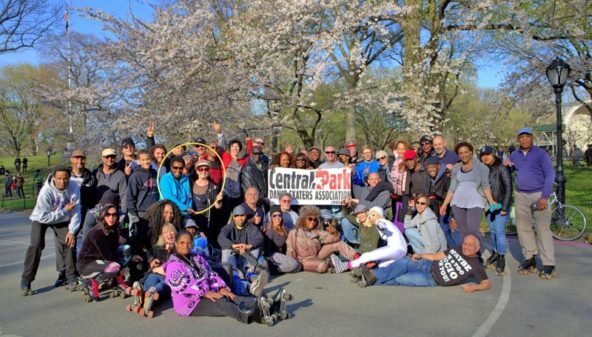 The Skate Circle began in the early 1980’s, but it wasn’t until the Guiliani administration tried to chase us out of the park, in 1995, that the Central Park Dance Skaters Association formed. We had to fight for our place in the park in the only way possible – negotiating with the Parks Department, jumping through all the official legal hoops and paying for all the requisite permits.